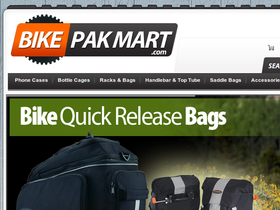 BikePakMart, online at bikepakmart.com, offers style, convenience and practicality in bike storage. BikePakMart carries a collection of carrier racks, bicycle bags, commuter bags, cell phone cases, smart phone mounts, bottle cages, handlebar cases, saddle bags, bike pumps, kickstands, and bike speakers and LED lights. BikePakMart features products from the innovative brand Ibera, and is committed to helping customers pay less. But before you shop, get all the latest BikePakMart.com discounts, BikePakMart promotions, and BikePakMart coupon codes found here at RetailSteal.com. BikePakMart offers standard shipping and expedited shipping. See site for more information. Save 15% on your $15+ purchase from BikePakMart online when you use our coupon code today. Hurry over to BikePakMart online today and enter our coupon code at checkout to save $5 on purchases $20+. Don't miss out on this limited time only discount. Shop at BikePakMart.com and enjoy free delivery on all orders Click link to get started. Save $5 at BikePakMart.com. Click here and use coupon code on purchases $15+ to enjoy discount. Enjoy a $10 discount on the IB-HB1 Handlebar Bag with this coupon code at BikePakMart. Click link for savings. Shop the clearance at BikePakMart and save up to 50% on bike bags and more. Shop now to save. Save 25% on the Ibera handlebar all weather clip-on bag from BikePakMart. Click here to get it for $10. Save up to 25% on bike accessories on sale at BikePakMat. Click link to shop. Shop at BikePakMart.com and save up to 20% or more on Ibera bike products, including bags, water bottle cages, and more. Shop for handlebar bags from as low as $10 from BikePakMart. Click here to shop.